In a four-level trophic system, if it is subject to trophic cascade, we might expect that the abundances of the top carnivores and the herbivores are positively correlated, as are those of the primary carnivores and the plants. 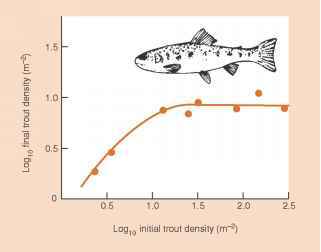 This is precisely what was found in an experimental study of the food web in Eel River, northern California (Figure 20.4a) (Power, 1990). Large fish (roach, Hesperoleucas symmetricus, and steelhead trout, Oncorhynchus mykiss) reduced the abundance of fish fry and invertebrate predators, allowing their prey, tuft-weaving midge larvae (Pseudochironomus richardsoni) to attain high density and to exert intense grazing pressure on filamentous algae (Cladophora), whose biomass was thus kept low. Support for the expected pattern also comes from the tropical lowland forests of Costa Rica and a study of Tarsobaenus beetles preying on Pheidole ants that prey on a variety of herbivores that attack ant-plants, Piper cenocladum (though the detailed trophic interactions are slightly more complex than this - Figure 20.5a). A descriptive study at a number of sites showed precisely the alternation of abundances expected in a four-level trophic cascade: relatively high abundances of plants and ants associated with low levels of herbivory and beetle abundance at three sites, but low abundances of plants and ants associated with high levels of herbivory and beetle abundance at a fourth (Figure 20.5b). Moreover, when beetle abundance was manipulated experimentally at one of the sites, ant and plant abundance were significantly higher, and levels of herbivory lower, in the absence of beetles than in their presence (Figure 20.5c). predatory invertebrates, grazing invertebrates and algae), the presence of the top predator did not lead to reduced algal biomass, because the fish influenced not only the predatory invertebrates but also directly affected the activity of the herbivorous species at the next trophic level down (Figure 20.4b) (Flecker & Townsend, 1994). They did this both by consuming grazers and by con-straining the foraging behavior of the survivors (McIntosh & Townsend, 1994). A similar situation has been reported for a four-level trophic terrestrial community in the Bahamas, consisting of lizards, web spiders, herbivorous arthropods and seagrape shrubs (Coccoloba uvifera) (Figure 20.4c) (Spiller & Schoener, 1994). The results of experimental manipulations indicated a strong interaction between top predators (lizards) and herbivores, but a weak effect of lizards on spiders. Consequently, the net effect of top predators on plants was positive and there was less leaf damage in the presence of lizards. 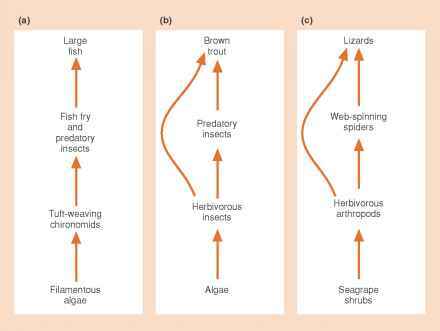 These four-level trophic communities have a trophic cascade, but it functions as if they had only three levels. What trophic level would a bettle be?